Nearly two decades after its initial publication, this behind-the-scenes tale reappears in paperback (after all, didn't Rolling Stone say it would ""sell forever""?). 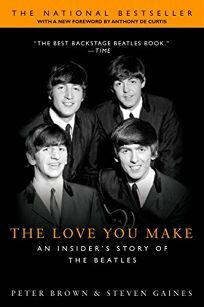 One of the suit men-as the Beatles dismissively, often with good reason, called the folk who saw to their business affairs-recreates the well-known saga of Beatlemania but does it dispassionately enough to make it interesting. Brown, who directed the Beatles management firm NEMS and later their disastrous financial organization Apple, seems to have survived the experience unscathed, the purges, rancor, glamour, notoriety, the dishonesty, jealousy and infighting among all those who wanted a piece of the action, or a bigger cut, which eventually came to include the musicians themselves as the group began to split apart. While seeming to be objective, he leaves little doubt about his preferences as he discusses the Beatles individually, their parents and in-laws, wives and lovers, probing the personalities to show us the underside of the pop culture with its sleazy pursuit of the big buck. There are revelations about John and Yoko and about their drug addiction, but the material is otherwise pretty familiar. Still, it's a dramatically good story and Brown catches us with the headiness of it all-and Gaines's now well-known name and a new foreword by rock critic Anthony DeCurtis may spark a little extra interest.